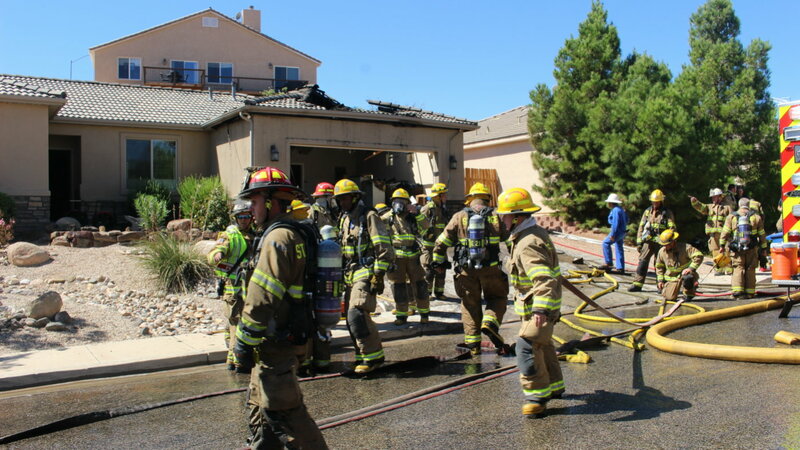 ST. GEORGE – A part-time firefighter sustained neck and back injuries Monday when a garage door fell on him during a house fire. City officials say he is likely to recover, but will be unable to work for the time being. In order to aid the firefighter and his family with expenses that arise as a consequence of the injury, donation accounts have been set up online and at a local back. Brent Fackrell, of St. George, was one of 36 firefighters who responded to a fire at 698 Lava Pointe Drive Monday. The fire started outside and had made its way into the attic space above the garage when the garage door came down on him. “We had a failure of a couple trusses and the garage area and the garage door came down, striking one of the crew that was inside the garage fighting the fire,” St. George Fire Battalion Chief Ken Guard said Monday. Fackrell was taken to Dixie Regional Medical Center for care and was diagnosed with a stress fracture in his back, according to a Go Fund Me page set up by Tyler Whitehead, a fellow St. George firefighter. He has since been released from the hospital and returned home to recover. “He will be unable to work for a few months,” Whitehead wrote on the donation page. Part of the garage holding the garage door and the garage door came down on him. Firefighters on the scene watched it and were able to get him out quickly. They said that his air tank saved him by keeping a gap for him. He was in the ER on Monday and released to go home later that night. He has a concussion, chest contusion, compression fracture in his back and overall pain. The neurologist recommended that Brent not sit up or stand up on his own for a week. Cassidy and Brent are staying with us so we can help him get up and down. He is in a back brace. He is not allowed to lift, bend or twist for a couple of months. He will get a new image in a month. Added to the overall complexity of the matter is the fact that Fackrell’s wife is also pregnant and expecting in the next month or so. “It’s an inherently dangerous profession,” St. George Fire Chief Robert Stoker said of firefighting. The St. George Department has been lucky that it hasn’t experienced any major accidents over the years. When they do, however, it can be hard to take, he said. Safety is the no. 1 priority of the Fire Department, Stoker said. Whether it’s in relation to the occupants of a home that’s on fire, the firefighters inside dealing with the fire, or the other emergency responders at the scene or the bystanders gathered to watch the operation, attempting to save the structure on fire comes second. Firefighters will withdraw their people and let a structure burn if they feel fighting it poses too much of a safety hazard, Stoker said. “When something like this happens, of course we’re very, very concerned,” St. George Mayor Jon Pike said Thursday. As a part-time firefighter, Fackrell does not have health insurance through the city, Stoker said. Part-timer firefighters are paid an hourly rate and help fill the shifts of firefighters who take time off, while reserve firefighters who are basically on-call and sleep at the fire stations at times get the insurance over the pay. In order to aid the Fackrell family during the firefighter’s recovery, there is an online Go Fund Me account which has so far raised $1,400, as well as an account at Cache Valley Bank set up by the St. George Fire Association. The bank account is called the “St. George Volunteer Fire Department For The Benefit Of Brent Fackrell.” According to the St. George Fire Department’s post, 100 percent of donated funds will go to the firefighter and his family. Ed. note: St. George News has not verified information provided in connection with fundraising accounts mentioned in this article and does not assure that monies deposited to the accounts will be applied as described. Those considering contributions are advised to consult with their own professionals for tax advice and investment risks. Does this poor man not get workers’ compensation for an injury on the job? We should be taking better care of our firefighters. In many states, safety workers would get full pay if injured so they and their families wouldn’t have to suffer additional hardship. Medical benefits are one thing, so I can see not giving medical coverage to a part time worker but not covering for a legitimate on the job injury? A city firefighter gets injured on duty fighting a fire and we need a charity fund to help him? Where is the city? Isn’t there IOD (injured on duty) status and funds to cover the firefighters salary, expenses, and recovery. This is pathetically cheap and an embarrassment to the city if a donation drive is truly needed to aid this fireman. Have you people seen the insurance for the city workers of St George. Lmao ! my dog has better medical coverage than city employees do. and this includes Police. File a claim with the homeowners insurance. It happened on their property. But how irresponsible to want to play firefighter and not have proper insurance in place like short term disability (Aflac). I’m confident he knew the risks but chose to participate anyway. You can’t play with fire and not expect to be burned. Perhaps this will serve as a lesson to other part time and volunteers for proper preparation. Ease up partner. Even I have a million dollar liability policy if someone if someone is injured on my property or in my pool. Don’t be coming over here hurting yourself. Just sayin’ caligirla concerns are valid. What a pompous, asinine comment. You don’t have a clue regarding his level of training or preparedness. All you know is he responded to a fire and was hurt and the best you can do is ridicule and tell him to file a claim with the homeowners insurance. What part of the “Valley” did you live in Cali? It’s not really asinine. He puts himself in harms way but failed to make sure his family would be covered in the event he was injured in a high-risk job. Would you drive your family through the Sahara on a half-tank of gas and with no bottled water? A simple prep step and they wouldn’t have to be asking for money. 42214 nailed it correctly McCoy. Your simile makes about as much sense as you seem to be capable of, zilch. I give Caligirl credit for suggesting he file against the homeowner’s liability insurance. But then she has to act like someone from Caliphonya. Then I should have used smaller words for you to understand. If you go to play hero but decide to not get the insurance that makes sure YOUR family is safe, then you failed to be a real hero. LOL! Y’all crack me up. Step up to the platter St. George city and Washington county and help this guy out! Pretty sad when a convicted felon convict who volunteers to work a forest fire just to get out of his cell has a stronger support system if he is hurt than a ST G Firefighter. Kill your kid in a hot car or get hurt fighting a fire results in the same thing. Charity car washes and donation drives.